Coaches Q and A: How Important is it for Juniors to Play Internationally? In this month's topic, coach Harold Solomon of the Harold Solomon Tennis Institute in Fort Lauderdale, Florida explores the benefits of international play for juniors. Q: How important is it to play international competition during the development years? A: We think that international play should be part of successful junior developmental plan. By successful, we mean junior players who have elevated themselves from top sectional players to elite national junior players. It has always been our thinking that before juniors start to exclusively play up or play only international events, they should be among the handful of dominate players in their age groups. There is a lot to be gained by getting to play international junior tennis. In the past, the best players came from the States, now the baton has been passed and the best players in the world are predominately in Europe and South America. If American juniors want to know if they are behind or ahead of the world's juniors, then international competition will give them a good idea of where they stand and what they have left to work on in their games. Playing on different surfaces such as red clay and grass can give juniors invaluable experience if and when they become good enough to entertain professional careers. The red clay of Europe and South America is far different from American clay and requires players to develop different shots and styles to be successful. We also think it is valuable for players who will eventually become professionals to have the experience of playing at some of the world's great tournament sites so that by the time they play at those sites as professionals they are less overwhelmed by the experience. We think that the whole experience of traveling overseas, getting used to foreign languages, different cultures, different foods, different players and playing conditions are an important part of an elite player developmental plan. Do you have a question for Andy Brandi or Harold Solomon? If so, please send it to clewis[at]zootennis[dot]com with the phrase Coaches Q and A in the subject line. There were no changes this week at the very top of the collegiate rankings, with the Virginia men and North Carolina women holding on to the No. 1 spots. But the No. 2 teams changed in both the men's and women's rankings. The Baylor women have yo-yoed from 1 to 7 to the No. 2 spot this week. Behind them in the top five are Florida, Northwestern and Duke. Miami moved into the Top 10 and Arizona State jumped from 23 to 16. The Ohio State men have overtaken Tennessee directly behind Virginia, with the Volunteers falling to third. USC is fourth, with Texas fifth. Stanford made the biggest jump of the top teams, going from 15th to seventh after wins over Illinois and Michigan last week, but after losing tonight to Baylor at the HP Cup in Palo Alto, they may not be there for long. The individual rankings, which are updated every other week, again have USC's Steve Johnson and Georgia Tech's Irina Falconi as the top-ranked singles players, with Stanford's Bradley Klahn and Ryan Thacher remaining atop the men's doubles rankings. Tennessee's Caitlin Whoriskey and Natalie Pluskota have also retained the top spot in the women's doubles, although Pluskota has not played in some time, and Whoriskey has recently been paired with Zsofia Zubor. For the complete rankings, both team and individual, see the ITA website. The final round of qualifying was played today in the women's $25,000 Pro Circuit tournament in Pelham, Ala., with 17-year-old Valeria Solovieva of Russia and 18-year-old Julia Boserup, both unseeded in qualifying, advancing to the main draw. Boserup breezed past US Open girls champion Heather Watson 6-2, 6-0 in today's match, while Solovieva delivered a love set in each of her three wins, including today's victory over Alexandra Mueller. Juniors Chanelle Van Nguyen, Grace Min and Nicole Gibbs received main draw wild cards, as did former Georgia Tech player Christy Striplin, who is from the area. The men are also in Alabama, although farther south, in Mobile, at the same location as the recent USTA Spring Championships. The main draw wild cards in the $15,000 Futures event went to Devin Britton, and junior players Dennis Novikov, who lost today, Denis Kudla and Vikram Hundal. None of the juniors in the qualifying advanced to the main draw, with Robert Verzaal and Mitchell Frank falling in the final round of qualifying. 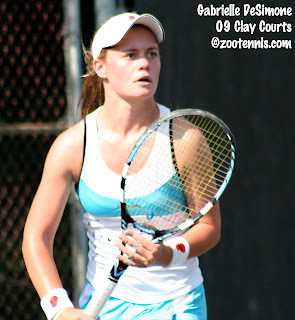 There's a new ITF tournament this week in Southern California, a Grade 4 event in Claremont. There were only a few byes in the qualifying, which isn't surprising given the number of junior tennis players in the area, and a couple of the local wild cards have already posted upsets. Yesterday TJ Pura defeated No. 2 seed Morgan Mays, and today 13-year-old Gabrielle Andrews upset No. 8 seed Kyle McPhillips. Even though he lost today, it is good seeing Dennis Mkrtchian's name in a draw again. The 2009 16s champion in Carson has played very little since then, with what I think was a foot injury. Complete draws can be found here. As promised, my detailed report on the Blue Gray Tennis Classic final between Texas Tech and Oklahoma is available today at The Tennis Recruiting Network. It was a fantastic match, despite the weather conditions forcing play indoors and despite less-than-ideal spectator viewing at the Auburn indoor courts. I also worked into the story the details of the big changes that are coming in 2011 for the event. I believe that adding women's teams to the mix will enhance the tournament. I don't know anyone who doesn't like the combined event that the NCAAs has become. Also, for those of you who are interested in reading about Marcelo Arevalo, the recent high-profile addition to the Tulsa team, the Montgomery Advertiser published this feature on the freshman from El Salvador. Now that we are securely into the conference seasons, I had expected more big matches this past weekend, but there haven't been many yet. The sixth-ranked Florida men traveled to Oxford yesterday to take on the No. 14 Ole Miss Rebels and emerged with a 4-3 win. For more on the extremely close win by the Gators, who won the doubles point on a tiebreaker at No. 1, see the Florida athletic site. Florida, No. 7 Georgia and No. 2 Tennessee are still undefeated in the conference after weekend play, primarily because they haven't played each other yet--those matches are scheduled for next month. All three teams are in the SEC East. The only team with a winning record in the SEC West is Ole Miss, who is 4-2 in the conference, having lost to Kentucky and Florida. The Arizona State women, ranked 23rd, beat No. 10 Cal 4-3 over the weekend, avenging a 6-1 loss to the Bears in February, and also recorded a victory over USC a couple of weeks ago in a match that didn't count in the conference standings. The Sun Devils lost to Stanford during their lengthy homestand, and it should be noted that Marina Cossou didn't play for the Bears, but the win puts Arizona in the middle of the Pac-10 title race. Cal hosts USC and UCLA this weekend, and goes to Stanford on the 17th, so it may go down to the wire, with the Sun Devils getting a crack at USC and UCLA in two weeks. For the recap of the win over Cal, see the Arizona State athletic site. And a reminder to check Marcia Frost's Tennis Examiner site for stories and results from the Big Ten, and to bookmark d3tennis for in-depth coverage of men's Division III tennis. Irina Falconi of Georgia Tech, who has been No. 1 in the ITA Campbell rankings since the first rankings in January, is the subject of the Collegiate Spotlight at usta.com. Falconi is 27-2 in the 2009-2010 season, having lost only to Jana Jurikova of Cal in the ITA Indoor final, and Caitlin Whoriskey of Tennessee at the Team Indoor, where she avenged her earlier loss to Jurikova. With 2008 NCAA champion Amanda McDowell still unable to play due to a back injury, the Yellow Jackets have certainly appreciated the nearly automatic point she gives them at No. 1. This Q and A is of particular interest to me, as I recently interviewed her coach, Bryan Shelton, for an upcoming Tennis Recruiting Network article. Her comments about Shelton are particularly perceptive, I think, closely matching my own impressions. USTA.com: Your coach, Bryan Shelton, is one of the most successful coaches in college tennis. What have you learned from him since coming to Georgia Tech? Irina Falconi: Ha, what haven’t I learned? Not only have I become a much smarter player on court, but I’ve learned to become a better person. I’ve never met anyone who has said something negative about Coach Shelton, and the fact that I get to be around him every single day – I’m definitely blessed. It's been a difficult couple of years for Shelton and Georgia Tech, with McDowell's injury and several unexpected transfers, but I don't believe that you'll sense any panic when you read the interview next month. While I was busy in Mobile, Tennis Australia announced that it had signed Pat Cash to work with some of its top juniors. Whether this is another move in the chess match between Craig Tiley and Paul McNamee for control of the organization's future, I can't say, but Cash had been critical of the current TA leadership in some stories I read. For those Cash will work with, and when, see this article from the Sydney Morning Herald. The LTA has come under a lot of criticism for many things in the past decade, but one thing I've always appreciated is their comprehensive tracking of British players on their website. This Week in British Tennis is a must for following all levels of professional play, and they have recently added a Junior Watch, which tracks what tournaments British juniors are competing in. They also have begun a "Rising Stars" section, which this week features 2009 Eddie Herr 14s champion Luke Bambridge, as well as a Bollettieri Academy profile, an article on Talent Identification opportunities and a Future Star diary. This story in the Scotland Herald features a look at 12-year-old Maia Lumsden, who recently won the Super 12 tournament in Auray, France, a major European title. (The draw can be found at Core Tennis, but I believe the girl Lumsden defeated in the final is from Canada, not the USA). The story also focuses on the nuts and bolts of the academy where she trains. A quick update of the results this week on the ITF Junior Circuit. At the Uruguay Bowl, Karue Sell of Brazil and Eugenie Bouchard of Canada won the singles titles at the Grade 2 event on clay. Bouchard, who was out with an injury for three months after her win at the B1 in Tulsa has played sparingly since the first of the year, primarily because she lost in the first round of three major tournaments--the Loy Yang Grade 1, the Australian Juniors in January and the Grade A Copa Gerdau this month. The second seed, Bouchard got her first win of 2010 in the first round and beat top seed Ulrikke Eikeri of Norway 6-7(5), 6-3, 6-1 in the final. Sell, who was a semifinalist at the 16s Dunlop Orange Bowl last year, was unseeded in Uruguay, but he breezed through the tournament without losing a set, defeating No. 4 seed Bruno Semenzato, also of Brazil, 6-1, 6-3 in the final. At the Grade 1 Mitsubishi-Lancer International in the Philippines, Dane Webb fell in the semifinals to Australia's James Duckworth, but had a convincing win over No. 1 seed Mate Zsiga of Hungary in the third round. Raymond Sarmiento, who was the No. 2 seed, lost in the third round of singles, but teamed with Francis Casey Alcantara of the Philippines to take the doubles title. The pair had a match tiebreaker win over Webb and Mitchell Krueger in the quarterfinals. The Manila Bulletin had this story about the championship match. For complete results of the tournaments, see the ITF junior website. Charlie Bricker, writing for World Tennis Magazine, wrote this feature earlier this week about Sloane Stephens and her mother, Sybil Smith, and the contract the two have that helps them through the inevitable rough spots of being a tennis child and tennis parent. Smith talks about her background in competitive swimming, and how she has modeled her approach after her mother's. This brings me to The Tennis Mom, which is a relatively new blog that I hope all tennis parents are reading regularly. Not only is Nicole a talented writer, but she is a what I am not--a tennis parent. I'm sure you will get a chuckle out of the first installment of her list of tennis parent types, as I'm certain you've all met or seen The Snob and The Wheeler Dealer at tournaments. And please make sure you read her profile of Rob Krajicek, the father of Texas A&M junior Austin, who has some very sensible advice based on his son's junior development experience. 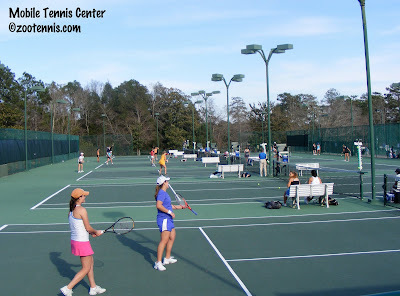 And for more on the health and fitness aspects of junior tennis, don't forget Mary Jo Campbell's blog, MJ TennisFit. Before I get to the bad news, the Easter Bowl acceptances are out for all three age divisions. In the 18s, the girls field is exceptionally good this year, even before the wild cards are named, and that's without USTA spring champion Danielle Collins, who is playing high school tennis in Florida. The last two Orange Bowl 16s champions, Breaunna Addison and Chanelle Van Nguyen are entered, as are 2009 US Open Junior quarterfinalists Beatrice Capra and Lauren Davis. 2009 Orange Bowl quarterfinalists Madison Keys and Robin Anderson are in the field, although Keys has not played since the Australian Open juniors this year. Ester Goldfeld, a quarterfinalist in Australia, as well as Courtney Dolehide, Kaitlyn Christian, Ellen Tsay, Grace Min, Lauren Herring, Jessica Pegula, Krista Hardebeck and Sachia Vickery are scheduled to compete; there are so many outstanding players, it's impossible to cite them all. The boys field is less impressive. None of the boys from the Junior Tennis Champions Center in College Park--Denis Kudla, Mitchell Frank and Junior Ore--are entered, leaving 2009 Easter Bowl semifinalist Raymond Sarmiento (27) and Dennis Novikov (42) as the highest-ranked ITF junior players in the draw. No. 37 Andrea Collarini, who is now representing the U.S. after spending most of his junior career under the Argentine flag, is not entered, nor is Jack Sock. Dane Webb, who is in the semis at the current Grade 1 in the Philippines, and Spring Champion Bjorn Fratangelo, Marcos Giron, Alexios Halebian and 2009 16s winner Shane Vinsant are among the contenders for the boys title. For the list of competitors, which does not yet include the wild cards, see the Tennis Link site. In the younger age divisions, Kyle McPhillips, who played the 18s division in last year's Easter Bowl, is entered in the 16s this year, as is 2009 14s champion Brooke Austin, Eddie Herr 14s champion Spencer Liang and Junior Orange Bowl 14s champion Yuki Chiang. The boys 16s will feature last year's 14s finalists Mackenzie McDonald and Nikko Madregallejo, as well as Reo Asami, Thai Kwiatkowski, Justin Butsch, Roy Lederman and Gage Brymer. In the girls 14s, Gabrielle Andrews will be a favorite, with Kenadi Hance, Julia O'Loughlin and Maria Shishkina likely to contend. In the boys 14s, Joe DiGiulio, Luca Corinteli, Christian Garay, Stefan Kozlov and Mac Roy are some of the top names. For the complete list, see the TennisLink site, and for more information about the tournament, visit easterbowl.com. Now for the bad news. Cal Poly has announced that it is eliminating both its men's and women's tennis programs. With the recent budget crisis in the California university system, I expect this won't be the last such announcement from a state school. And Wayne Odesnik has pleaded guilty to possession of Human Growth Hormone, which was discovered by Australian custom officials in January. This doesn't have a lot to do with college or junior tennis, but I think it's important to mention that even with extensive testing on the professional level, there is no reason to think that tennis players are somehow immune to the lure of performance enhancing drugs. And with very little testing in the juniors and college, it's likely that PEDs are used by some amateurs too. For more on the Odesnik case and on PEDs in tennis, see Greg Couch's article at FanHouse. 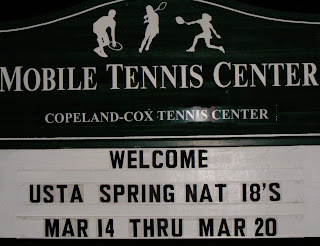 My article for Tennis Recruiting Network today is a recap of the USTA Spring 18s Nationals in Mobile. Although the weather wasn't great, particularly in the early morning and the evenings, cold always beats rain, and Scott and Lorraine Novak, the tournament directors, are always looking--and finding--ways to improve the tournament. In its sixth year of existence, the tournament is getting a well-deserved reputation for top-notch organization and amenities. I've tried to include some of those in the slideshow below. By the way, when you are at tennisrecruiting.net, make sure you check out their recent profiles of seniors, which are part of the lead-up to April's signing week. I'm posting short videos of the singles champions Bjorn Fratangelo and Danielle Collins below. For a video of finalist Robin Anderson, click here. For one of finalist Greg Andrews, click here. And if you didn't get the chance to watch the daily video reports from the Spring Nationals, professionally produced by Dave "Koz" Kozlowski and Bob Gray, they can be seen at indietennis.com. The USTA has released the names of the winners of the annual Bill Talbert Jr. Sportsmanship Awards. The juniors honored for 2009 are Shaun Chaudhuri of Pleasanton, Calif., Neil Karandikar of Belle Meade, N.J., Marc Powers of Stamford, Conn. and Caroline Price of Duluth, Ga. The USTA has added a great new feature to these national awards, producing videos of all the winners, which provides so much more context to their selection. The juniors and their families are traditionally invited to July's International Hall of Fame induction ceremony in Newport, Rhode Island. To see the videos, click here. The dates and venues for all the sectional qualifying events for the US Open National Playoffs have been set, and entries are being accepted in 16 of the 18 sections now. In fact, the Eastern Section's tournament will be held April 18-26 at the USTA BJK National Tennis Center, so entries close for that event April 5th. Participants can compete in any section that fits in their schedule, but only in one such tournament. Juniors age 14 and older are eligible. For the complete list of dates, locations and entry deadlines, see usopen.org. USTA Florida's event will be held at the IMG/Bollettieri Academy in late May. Rick Workman, the Eddie Herr tournament director, will be in charge of the event, according to this article on USTA Florida's website. I received the weekly rankings press release from Jason Berney at the ITA this afternoon, and his tone was just short of incredulous as he revealed that the North Carolina women had retaken the No. 1 ranking, switching place with now No. 7 Baylor, who, um, WON their two conference matches last week against Oklahoma and Oklahoma State, while North Carolina didn't play. The fact that Baylor recently beat North Carolina makes this all the more baffling, yet as Berney says, "No matter which team will be ranked No. 1 next week, you can bet that the remainder of the season will be filled with changes at the top.."
If it's stability that you want, you might consider taking a look at a) the men's Campbell/ITA rankings, or b) the Texas College Tennis blog's womens rankings, where Northwestern is No. 1, Florida 2, Duke 3, Baylor 4, North Carolina 5 and Notre Dame 6. This is the same top 4 as last week, with Notre Dame at 5 and North Carolina at 6. So assuring that more changes are inevitable in next week's rankings, North Carolina beat Northwestern 5-2 this afternoon in Chapel Hill, avenging their 4-2 loss in the final of the Team Indoor last month, despite losing the doubles point. Given what happened with this week's rankings, would anyone be shocked if Northwestern lost to Duke in Durham Wednesday at ended up back at No. 1? The importance of the rankings comes at the end of the season, when the top 16 teams generally are selected to host the regionals (the Fresno State women, and Baylor and Ole Miss men would like to remind you that this wasn't the case in 2009). It doesn't matter now. For what it's worth, in the Campbell/ITA women's rankings, North Carolina is currently No. 1, Northwestern 2, Notre Dame 3, Florida 4 and UCLA 5. Georgia Tech moved from 36 to 13 on the strength of their wins last week over Georgia and Vanderbilt, while Texas A&M has entered the rankings at No. 44. The Virginia men have held their top ranking since winning the Team Indoor, with Tennessee at 2, Ohio State 3, Texas 4 and USC 5. Duke had the biggest jump this week; their win over USC last week helped them climb from 50 to 24. Stanford, which hadn't had a match since March 3rd, fell from 13 to 15, but today beat No. 11 Illinois 4-3 in Champaign. Stanford plays Michigan on Thursday in Ann Arbor with Wolverine freshman Evan King getting his first opportunity to compete against the Cardinal. King is the subject of the most recent College Spotlight at usta.com. I'm back in Michigan after ten days in Alabama. Part of the price I pay for on-site coverage of junior events is losing track of what's going on elsewhere in the tennis world. I realize I've been neglecting college tennis, the Pro Circuit and other junior news. Yesterday I posted on the week's ITF junior news, tomorrow I'll try to catch up on college tennis when the new team rankings are released. There is no Pro Circuit action in the U.S. this week, and last week's women's Pro Circuit event in Fort Walton Beach, Fla. didn't have many U.S. success stories, although Shelby Rogers did qualify and win a round in the main draw. The qualifying began today for the Sony Ericsson ATP/WTA event at Key Biscayne, and several juniors were among those competing. There was a rain delay this morning, so I'm not sure if all the matches on the schedule will be completed today, but so far, only one of the wild cards have advanced to the second round. CoCo Vandeweghe defeated Maria Elena Camerin of Italy, the 20th seed, 6-1, 6-3. Lauren Davis fell to France's Pauline Parmentier, the 24 seed, by the odd score of 2-6, 6-0, 6-0. Beatrice Capra also got off to a good start and a bad finish in her match with No. 18 Rossana De Los Rios of Paraguay, losing 2-6, 6-4, 6-0. Sloane Stephens couldn't duplicate her impressive results at Indian Wells, falling to No. 14 seed Yung-Jan Chan of Chinese Taipei 6-1, 6-2. Christina McHale and Viktoriya Tomova of Bulgaria, who trains at Bollettieri's, had not completed their matches as of 9 p.m. The main draw begins on Tuesday, but none of the wild cards into the main draw went to American players, juniors or otherwise. Seventeen-year-old Michelle Larcher de Brito of Portugal did receive a main draw wild card, as did Ajla Tomljanovic, who trains at Evert's. In the men's qualifying, wild card Alex Domijan lost to No. 23 seed Kevin Kim 6-4, 6-4 and Jack Sock, who according to this Sun-Sentinel story hit with Roger Federer on Stadium Court, lost to No. 4 seed Marcos Daniel of Brazil 7-6(1), 6-0. Another junior wild card, Yuki Bhambri of India, has not yet played. Ryan Harrison and Filip Krajinovic received main draw wild cards. For draws and results, see the tournament website. The entry lists for the ITF Grade 1 International Spring Championships, which begin on April 5th, are available on the ITF junior website. There are no ITF Top 20 player in either boys or girls draws. Raymond Sarmiento is the highest-ranked boy in the field at No. 28. Katarena Paliivets of Canada is the highest-ranked girl at 37. The 16s acceptances lists, including wild cards, can be found at usta.com. I've been fortunate to cover some very exciting dual matches this season, and today I added another to my list, with Texas Tech's 4-3 win over Oklahoma in the finals of the Blue Gray Classic. It's hard to top the thrill factor of a doubles point that goes to a 10-8 tiebreaker in the deciding match, but the singles had plenty of twists and turns too, and was ultimately decided with a late break in the third set at No. 1 singles, with Tech's Raony Carvalho defeating Oklahoma's Andrei Daescu. I'll be doing a full match report for the Tennis Recruiting Network, and have more information at that time about the changes that are coming for next year's Blue Gray tournament, as well as comments from both Texas Tech coach Tim Siegel, a veteran of the competition, and first-time participant John Roddick of Oklahoma. In the meantime, see the Texas Tech athletic site for their story and results. There may be a bigger shot in college tennis than Carvalho's forehand, but I haven't seen it. Although pace is amplified indoors, several of the sophomore from Brazil's shots from that side were hit as hard as any you might have seen at Indian Wells this week, maybe harder. When Carvalho is not making errors, as he didn't in the first five games of the opening set against Daescu, he is devastatingly good. Fortunately for the rest of the men playing college tennis, he doesn't always play at that level. It was a great call by the tournament officials to move the match indoors, and it was fortunate that the Auburn indoor facility was available. Although it cleared off by 3 p.m. in Montgomery, it was miserable at match time, and waiting could have disrupted travel plans and forced play under the lights. Not many spectators made the 45 minute drive to Auburn, which wasn't necessarily a bad thing, as the viewing consists only of small bleachers next to court one. The Big 12 is one tough conference right now on the men's side. Six of the seven teams are in the Top 25, and all are playing exceptionally well right now. It should be a very interesting conference season, which I'm sure Texas College Tennis blog will be following closely. Now, on to the ITF junior tennis news. There were three tournaments in the Caribbean/Central America region this week, an ITF Grade 1 in Malaysia and the Copa Gerdau taking place in Brazil. U.S. players went deep in several events, with Puerto Rico's Monica Puig winning the Grade A in Brazil over American Jessica Pegula. Puig, the No. 2 seed, who is already in the ITF Top 10, has to be relieved to have won a final after several second place finishes this year, and is sure to climb even higher in the rankings with this win. For the unseeded Pegula, the 2-6 7-6(5) 6-3 loss isn't a disappointing result, and she will also get a boost in the rankings. The boys Copa Gerdau title went to unseeded Mathias Bourgue of France. At the Grade 1 in Malaysia, Dane Webb reached the semifinals in singles and in doubles, Webb and Mitchell Krueger were also semifinalists. At the Grade 4 in Barbados, Caroline Price and Robert Livi made the singles finals, and Price won the doubles with Daria Sharapova, who trains at Bollettieri's. Trey Strobel and Ronald Powell won the boys doubles in Barbados. On clay in Panama's Grade 4, four U.S. girls made the semifinals. Fourth seed Belinda Niu defeated No. 6 Ashley Dai 6-4, 5-7, 7-5 and No. 5 Tristan Dewar beat Gabrielle DeSimone 6-3, 6-3. In the final, Niu downed Dewar 6-3, 7-6(3). Niu and DeSimone won the doubles title. For all the results, see the ITF junior website. Bjorn Fratangelo has an enviable progression going. In January of 2008, he won the 14s Winter Nationals, last year he earned the 16s Clay Court Championship, and with a 6-3, 6-1 victory over Greg Andrews in the finals of the USTA Spring Nationals Saturday, the 16-year-old from Pittsburgh now has a gold ball in his first 18s Championship. For girls champion Danielle Collins, also 16 years old, the gap between gold balls had been considerably longer, dating back to her 12s Clay Court victory in 2006. While the hard-hitting right-hander from St. Petersburg, Fla. no longer resembles the moonballer she was back then, Collins did find that shot useful in her 5-7, 6-0, 6-2 victory over Robin Anderson of Matawan, New Jersey. "In the 10s and 12s that's all I did, I didn't ever hit the ball hard," Collins said. "Today I was missing a lot, so I thought I'd try to slow down the pace a little bit, maybe try to throw her off with high balls." Collins' strategy of keeping more balls in play began to produce results in the second set, when Anderson started to show signs of both physical and mental fatigue from her nearly three-hour semifinal win over Krista Hardebeck on Friday. "In the second set, she started keeping the balls in the court and making me play a lot more shots than I was in the first set," said Anderson, the No. 8 seed. Collins stuck with that strategy, reeling off nine straight games before Anderson finally held in the fourth game of the final set. By that time, Collins was swinging much more freely, and her devastating backhand was giving Anderson very little chance to go on the offensive. With a 5-1 lead, Collins stepped to the line to finish the match, but quickly lost the first three points of the game, two on unforced errors, and dropped her serve for the first time since the opening set. "I think I got a little bit nervous," the third-seeded Collins said. "There were some things running through my head. I think the nerves just kicked in at that point. It happens. It would have been nice if I could close it out right away." With her success rate in breaking Anderson's serve, Collins could anticipate another chance soon, and she got it after Anderson failed to convert her 40-15 lead, and at deuce hit a forehand long. After a long rally on that first match point, Collins tried an ill-advised drop shot against the speedy Anderson and lost the point; on the second match point, Collins hit a backhand long. On the third match point, Collins slammed a ball deep, and Anderson's defensive reply floated long, giving Collins her first national 18s title. "I finally got a gold ball in the 18s," said an excited Collins, who has been playing in that division for over three years. "It feels pretty good." Fratangelo remembers playing Andrews a few years ago and losing badly. But it's not the size or the power improvements that Fratangelo credits with his success this week. "It's handling my nerves," said Fratangelo, who trains in Naples, Fla. during the winter months. "When I was younger, I used to get extremely nervous. But just playing the big matches--Junior Davis Cup (Fratangelo was on the team that finished fifth in the ITF 16-and-under World Team Championships), gave me a lot of confidence just to do my thing and believe in myself." Neither Andrews nor Fratangelo had lost a set prior to the finals, yet in the first set of the championship match, neither played as if they wanted to win it. Andrews got an early break, then couldn't hold serve, as Fratangelo got a key hold at 4-3 to take command of the set. "In the beginning I didn't really know what to expect from him," said Fratangelo. "I know he has a great serve and a humongous forehand. I guess we were both a little tight, but then I got loose, felt better out there, and started hitting my shots." Fratangelo didn't avoid the Andrews forehand, because he didn't want to surrender his primary weapon. "He has a great forehand, but that's my best shot too," Fratangelo said. "So I wasn't going to be afraid of his. I know he likes to protect the backhand side, and I was trying to open up the court by going to his forehand side." Andrews admitted that his unfamiliarity with playing in a national final contributed to his loss, as did his inability to hold serve. "I definitely missed a lot of first serves," said the Richland, Mich. resident, who turned 18 on Friday. "He jumped on my second serve--he's a great returner, and against a player that good you can't be missing that many first serves." Trailing 5-0 in the second set, Andrews held serve, and saved two match points at 40-15. Fratangelo saved a game point for Andrews with a rare ace, and after a backhand error from Andrews, Fratangelo earned match point number three. After a short rally, Andrews' backhand went wide, and Fratangelo looked over at his family and friends, pumped his first, and proceeded to the net for the handshake. 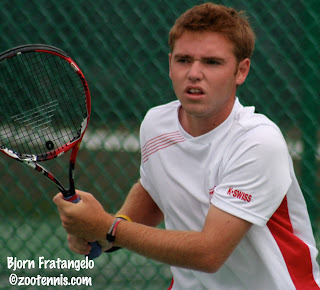 Now one-for-one in 18s national championships, Fratangelo will continue to play both junior events and Pro Circuit Futures, where he has a specific goal. "I've been playing a couple so far and haven't had much luck getting through qualies," said Fratangelo, who is named after the Swedish tennis legend. "My goal is just to get one ATP point to start out with. But I'll definitely play I think Clays and for sure Kalamazoo." In other matches played on Saturday morning, bronze balls went to Emmett Egger and Krista Hardebeck. No. 7 seed Egger defeated No. 17 Asika Isoh 4-6, 6-4, 6-3, while No. 5 seed Hardebeck downed No. 6 seed Whitney Kay 6-1, 6-2. Fifth place in the girls tournament went to No. 2 seed Lilly Kimbell, who defeated No. 15 seed Lynda Xepoleas 6-3, 6-2. Wyatt McCoy, the 10th seed, took fifth place in the boys tournament. 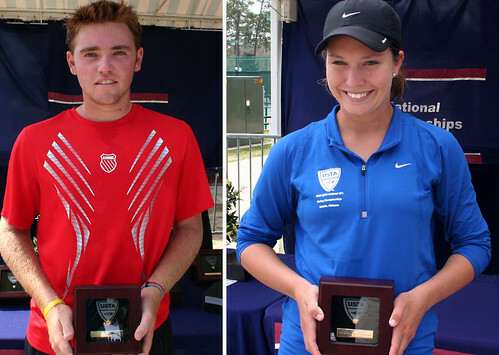 The USTA sportsmanship award recipients were Whitney Kay and Daniil Mamalat. Dave "Koz" Kozlowski, has daily video reports at indietennis.com. Day six is available now, with the final day's segment scheduled to be available on Sunday morning. Greg Andrews, Danielle Collins and Robin Anderson earned a shot at their first USTA Level 1 championships with semifinal victories Friday, while the fourth finalist, Bjorn Fratangelo, will be seeking his first gold ball in the 18s division Saturday morning. Anderson had the most dramatic semifinal victory, with the 16-year-old from New Jersey, seeded eighth, defeating No. 5 seed Krista Hardebeck 5-7, 6-1, 7-6(4) in a match that seemed to have a swing in momentum every third point. Anderson served for the match at 5-4 in the third, having broken Hardebeck the previous game when the 15-year-old Californian double faulted on game point. Anderson earned a match point at 5-4, 40-30 but shanked a backhand before the rally got started, and Hardebeck went on to win the game. After Hardebeck held with a forehand winner at 40-30, Anderson went down 15-30, desperately needing the next point. She got it with a clutch backhand winner and when Hardebeck then donated two unforced errors, it was on to the tiebreaker. Hardebeck took a 4-3 lead in the tiebreaker with a backhand winner, but her next two serves proved to be her undoing. She double faulted on both, letting out a piercing scream after the second. After a long rally on the next point, Hardebeck missed a backhand wide, and Anderson had her second and third match points. She needed just one. Hardebeck put a certain winner into the corner, but Anderson somehow got her racquet on it and scooped it back toward the net. It hit the tape and fell on Hardebeck's side, dying there before Hardebeck could react. "I just prayed that it would go over the net," Anderson said. "I was kind of surprised when it did." Anderson made an adjustment after the first set that allowed her to counteract the powerful ground strokes of Hardebeck. "In the first set I was trying to hit with her, hit through the ball, rally with her, but it wasn't really working," Anderson said. "So in the second set I started mixing it up, hitting some high balls, hitting through the ball, hitting a lot of slices, hitting drop shots, changing it up, so maybe she wouldn't know what was coming. I was still doing a lot of running, but I think it was a little bit better." Anderson will need all that variety in Saturday's finals against the third-seeded Collins, who overpowered No. 6 seed Whitney Kay 6-1, 6-3 in the semifinal. Although there were many deuce games, and the match took nearly 90 minutes, Collins was pleased with her performance. "I knew that if I wanted to beat her I would have to play really solid," said Collins, a resident of St. Petersburg, Fla. "I had to hang in there, get a lot of balls back and be really consistent. She's a really good player. My serve was a little shaky there for a while, but I got it together at the end." With her best showing at a USTA National being a quarterfinal appearance at last year's Clay Courts, the 16-year-old Collins is excited to be vying for a gold ball. "I'm happy I got to the finals," she said. "I've been trying for a while, but I always lose in the round of 16 or the quarterfinals." For the third rookie finalist, Andrews, it was a doubly special day, as he celebrated his first appearance in a national final along with his 18th birthday. Andrews, the sixth seed, defeated Asika Isoh 6-4, 6-4, overcoming an early bout with nerves to earn the victory. "I've never been this far in a Supernational before, so I was pretty jittery at the start," said Andrews, who is from Richland, Mich., a few miles from Kalamazoo. "I loosened up as it went on." Andrews trailed 3-0 in the opening set, but got the break back in the fifth game, then broke Isoh at 4-4 and held to secure the first set. There was only one break in the second set, with Andrews taking a 4-2 lead and pounding forehand winners often enough to keep Isoh on the defensive throughout the remainder of the match. "It's definitely my best shot, so I'm trying to hit as many of those as I can," said Andrews, a Notre Dame recruit who has played sparingly this winter and spring and admitted that boredom was one of the factors in his decision to enter the tournament. "I played a sectional tournament a month back, but before that it was probably two months since my last one. So I was a little nervous. I wasn't playing my best in practice leading up to this, but I've had some good result so far." The same is certainly true of Fratangelo, the reigning 16s Clay Court champion. Playing in an 18s National for the first time, the 16-year-old from Pittsburgh downed No. 2 seed Blake Bazarnik in the quarterfinals, and in Friday's semifinal, took out No. 7 seed Emmett Egger 6-2, 6-3. "I felt pretty good," said the ninth seeded Fratangelo, who also defeated Egger 6-4, 6-1 on his way to a third place finish in the Kalamazoo 16s last year. "In the beginning he served really well, held at love, and I was kind of worried. But I felt good overall. The nerves were there, but nothing too major, so I was pretty happy." Fratangelo trailed 3-1 in the second set, but Egger double faulted on game point serving at 3-1, and didn't win another game. Fratangelo made very few errors in the final four games, while Egger missed frequently as his frustration level grew. On one point that drew applause from the small crowd in attendance, Fratangelo got back volley after volley as Egger tried vainly to put away a shot, unable to get it beyond a scrambling Fratangelo's reach. When Frantangelo somehow won that point, Egger seemed permanently discouraged, and the match concluded swiftly after that. Fratangelo and Andrews have played before, back in the 14s, with Andrews winning easily. "We were both pretty little at that time," said Andrews. "He's gotten a lot better. I'm not expecting that result." Although Fratangelo has more experience in National finals, he's not underestimating his opponent. "I know Greg's committed to Notre Dame, so he knows what it takes to play good tennis. It'll be a good match." The doubles championships were decided on Friday, with the defending champions and a first-time team claiming titles. 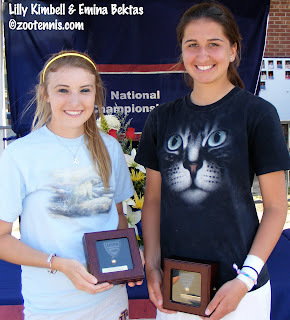 Emina Bektas and Lilly Kimbell, who won the Spring 18s title in 2009, collected another championship with a 6-1, 6-3 victory over unseeded Mary Jeremiah and Megan Kurey. Bektas and Kimbell had fought off three match points when trailing 9-6 in a match tiebreaker against Blair Shankle and Elizabeth Begley in the round of 16, but their confidence never waivered. "We always thought we could win," said Bektas, a 2011 high school graduate. "It's not over until the last point," said Kimbell. Reflecting on two consecutive titles with her longtime partner and friend, Kimbell was almost nostalgic. "This is really special to me, because I'm pretty sure this is my last Supernational," said Kimbell, who is heading for Georgia this fall. "Playing it with Emina was really fun, and I'm just glad she's my doubles partner." With that partnership ending, another successful one was beginning. No. 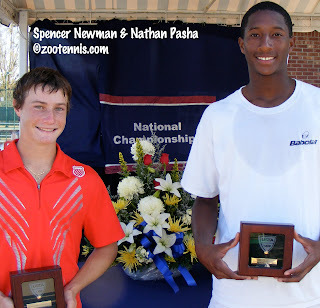 5 seeds Nathan Pasha and Spencer Newman, who train together at the USTA National Center in Boca Raton, had never played as a team before, but they topped No. 1 seeds Chase Curry and Jeffrey Offerdahl 6-3, 6-1. "We just had to get used to each other in the first round," Newman said. "Everything was pretty in synch, since we know each other." "Good chemistry and good teamwork equals a good doubles team," said Pasha. As with the girls champions, Newman and Pasha needed to win a match tiebreaker to advance, theirs a 6-4, 4-6, 10-5 victory over Matthew Dooley and Ben Guthrie in the quarterfinals. "I was just struggling period that day," said Pasha. "So Spencer had to carry me. But when things aren't going well, we just try to keep our energy up. We figure that's a key to playing good doubles, whether you're playing good or bad." Newman and Pasha will team up again in just a few weeks for the International Spring Championships and the Easter Bowl. Third place in boys doubles went to Jeremy Efferding and Fratangelo, when Samuel Fife and Kyle Roth were unable to play the match for the bronze ball. In the girls third place match, Julie Sabacinski and Britney Sanders defeated Allison Falkin and Alexandra Leatu 6-4, 7-5. In the girls consolation final on Saturday, Lynda Xepoleas, the No. 15 seed, will play No. 2 seed Kimbell. Tenth seed Wyatt McCoy was the boys consolation winner when the third-seeded Pasha was unable to compete in Saturday's final. 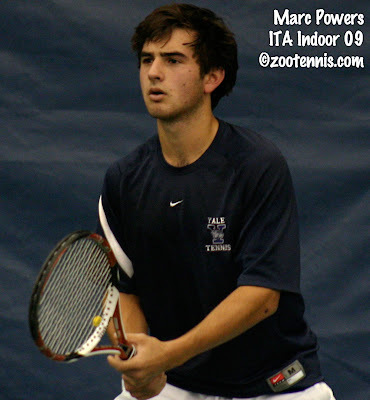 Dave "Koz" Kozlowski's report on day five at the Spring Nationals can be found at Indietennis.com. Thursday wasn't a good day to be a high seed at the USTA Spring 18s Championships. The top two seeds in the boys draw--No. 1 Gonzales Austin and No. 2 Blake Bazarnik--and the highest seed in the girls draw--No. 2 Lilly Kimbell--dropped quarterfinal contests. Kimbell was the first to taste defeat on yet another unseasonably cool day at the Copeland-Cox Tennis Center, when No. 6 seed Whitney Kay come from behind in both sets to claim a 7-6(6), 6-3 decision. Kay, from Alpharetta, Ga., trailed 5-3 in the opening set, with Kimbell serving for the set at 5-4. Kimbell failed to convert her lone set point at 40-30 when Kay hit a backhand winner down the line, lost that game and the next one. With Kimbell serving at 5-6, Kay had three sets points, but made errors on each one of them, and Kimbell held for the tiebreaker. The first six points of the tiebreaker went to the server, with the first break going to Kay, when Kimbell was overruled on a forehand she called wide. Kay got a second overrule in her favor two points later, but at 6-4, she let set points four and five slip away, again with errors. Finally, on her sixth set point, Kay didn't commit an error, and Kimbell's netted forehand was the reward for Kay's patience. "If I had gotten mad I would've probably lost more," said Kay, who started off the week with an illness that sapped her strength. "I try to stay positive." Kay was called on to exhibit that trait again when she fell behind 3-1 in the second set, but Kimbell didn't win another game. "She kind of started out hitting it more," said Kay, who like Kimbell is less likely to win a point with pace than with angles, spin and placement. "She had been hitting it higher before. Then I got used to it a little bit and she started playing a little bit more tentative after that and gave me a chance to get back in it." Kay's semifinal opponent Friday is No. 3 seed Danielle Collins. Collins, from St. Petersburg, Fla., looked as if she was going to breeze past No. 7 seed Monica Turewicz, taking a quick first set at love, but Turewicz fought back with two late breaks to take the second set. Collins again jumped out to a big lead in the third set, and held on for a 6-0, 5-7, 6-2 victory. The other two girls quarterfinals took less than an hour to complete. Robin Anderson, the No. 8 seed, downed Julie Vrabel, a 17 seed, 6-1, 6-0, and No. 5 seed Krista Hardebeck also dispatched a 17 seed, Katie Goepel, 6-1, 6-3. Boys No. 2 seed Blake Bazarnik had been living on the edge all week, with three of his victories going the distance, two of those from a set down. But against No. 9 seed Bjorn Fratangelo Bazarnik couldn't summon that comeback scenario, losing 6-3, 6-2. "I felt a little sluggish because of last night's doubles, which finished at about 10 o'clock at night," Fratangelo said. "So to start the match I was just worried about holding serve. Serving at 2-3, I got the adrenaline going, I held, and played a really good game to break and got the set from there." Fratangelo went up 4-0 in the second set, but admitted that there were some tense moments. "My nerves kind of got to me a little bit," said the 16-year-old from Pittsburgh. "He got back a break and held, but from there I just tried to keep my nerve and get through the match." Fratangelo will meet No. 7 seed Emmett Egger in Friday's semifinal. Egger eliminated the last unseeded player, Californian Gregory Scott, 7-6 (1), 6-1. Boys top seed Gonzales Austin survived a 6-4 in the third battle on Wednesday, but he couldn't hold off No. 6 seed Greg Andrews, who came back from 5-1 down in the second tiebreaker to earn a 7-6(0), 7-6(6) win. Austin had saved a match point serving at 5-6 in the second set, with an aggressive forehand approach, and when Andrews double faulted to give Austin a 4-0 lead in the tiebreaker, it looked as if there would be a second consecutive lopsided tiebreaker. But Andrews' forehand began to heat up and at 5-1, he hit hit two clean winners and forced an error to make it 5-4. Austin earned two set points with a service winner, but Andrews saved one with a backhand winner that Austin made a late out call on but was overruled. Serving on the second set point, Andrews pulled even when an Austin forehand drifted just long. Yet another forehand winner gave Andrews his second match point, and this time Austin found no magic. He shanked a forehand high into the air, giving Andrews the victory. Andrews, a Notre Dame recruit, will face another senior in the semifinals--No. 17 seed Asika Isoh, who is committed to West Point. Isoh, who beat No. 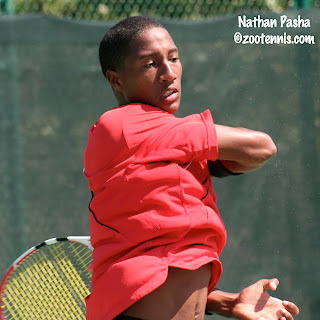 3 seed Nathan Pasha on Wednesday, continued his impressive run with a 7-5, 6-3 victory over No. 17 seed Chase Curry. The doubles finals are set for Friday, with the top seeds playing for the championship. The No. 1 boys team of Curry and Jeffrey Offerdahl will take on the No. 5 seeds Spencer Newman and Nathan Pasha after both teams recorded straight set victories Thursday afternoon. Curry and Offerdahl defeated the No. 3 seeds Samuel Fife and Kyle Roth 7-5, 6-1, while Newman and Pasha downed unseeded Jeremy Efferding and Fratangelo 6-2, 6-3. Defending champions Emina Bektas and Lilly Kimbell, the girls No. 1 seeds, started slowly in their semifinal match with No. 3 seeds Allison Falkin and Alexandra Leatu but recovered for a 6-3, 6-2 victory. Bektas and Kimbell will meet the unseeded team of Mary Jeremiah and Megan Kurey, after the Georgia pair upset No. 2 seeds and future Notre Dame teammates Julie Sabacinski and Britney Sanders 7-6(1), 6-2. Despite being unseeded, Jeremiah and Kurey have not needed a third set or a match tiebreaker in any of their wins. For the complete draws, see the TennisLink site. The Inside Tennis with the Koz segment for Wednesday includes several interviews with college coaches who are in Mobile recruiting. Go to indietennis.com for daily videos from the Spring Nationals. 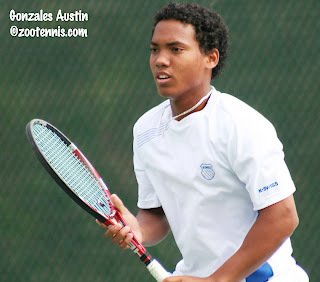 Boys top seed Gonzales Austin has been working on controlling his emotions, and it paid off during Wednesday's rain-delayed fourth round action at the Spring 18s Nationals. Down a break in the third set against unseeded Nick Papac, Austin kept his composure, made a strategic adjustment and earned a 6-2, 4-6, 6-4 win. "I've been getting really frustrated in practices in the past couple of months and my coach gave me some advice," said the 17-year-old from Miami, who spent the morning with his fellow competitors, waiting for the courts to dry when a steady rain gave way to cool and cloudy conditions. "He said create something in your head where you do this thing first, before you react. So I do a little ritual after I miss an easy ball, or even after I hit a good shot, and by the time I'm done with it, I don't feel like reacting to it anymore." Papac, who has impressed all observers with his game this week, broke Austin at 4-4 in the second set, then held at love to even the match. Continuing to keep Austin on the defensive with a penetrating forehand, Papac broke his fellow left-hander at 2-2. But Austin immediately broke back, with Papac showing his first sign of tentativeness by double faulting at 15-40. That blip was a rare one, however, as both boys played with controlled aggression throughout the third set, and most points won were the result of winners or forced errors. Austin finally began to figure out how to cope with Papac's defense, although he conceded that he never did find a way to neutralize the Californian's forehand. "I tried to get it to his backhand, but he had a great defensive slice, that he put low on me every time," Austin said. "I struggled with it at first, but once I started to get a rhythm on the slice, timing it correctly and moving forward correctly, I started hitting better shots off the slice. I should have kept it away from his forehand the whole time, but I didn't do it, and it was a tougher match than I expected." Austin lost only one point on his serve in the seventh and ninth games, while Papac had to survive three deuces before winning the eighth game. With Papac serving in the final game of the match, Austin hit a perfect crosscourt forehand pass to get to 0-30, and at 15-30, Papac was forced into a defensive forehand slice, which landed just long. With his first match point, Austin hit a forehand approach so well that he didn't need to volley, with Papac's response failing to clear the net. Austin, who had won his three previous matches in straight sets, believes winning a close match will help him. "I might be a little tired, but I think it was good. I needed that challenge," said Austin. "I haven't been challenged really in the early rounds, so that was good. It kind of woke me up to the competition I was going to see later on." In Thursday's quarterfinal, the reigning USTA Boys 16 National champion will play No. 6 seed Greg Andrews, who defeated No. 15 seed Jeffrey Offerdahl 6-1, 6-4 Wednesday. Two No. 17 seeds will meet in the other top half quarterfinal. Asika Isoh of New York frustrated No. 3 seed Nathan Pasha and went on to claim a quick 6-1, 6-3 victory. Isoh's opponent on Thursday will be Chase Curry, who took out fellow Texan Jose Martinez, who was unseeded, 6-2, 6-4. Gregory Scott, the lone unseeded player remaining in either singles draw, will face No. 7 seed Emmett Egger. Scott outlasted No. 17 seed Raleigh Smith 7-5, 6-7(4), 6-2, while Egger dominated unseeded wild card Spencer Newman 6-2, 6-4. No. 9 seed Bjorn Fratangelo breezed by unseeded Andranik Khachatryan 6-1, 6-0 and will meet second seed Blake Bazarnik on Thursday. Bazarnik survived his third three-setter of the week against No. 14 seed Harry Seaborn, emerging with a 1-6, 6-0, 6-3 victory. As has been the case throughout the week, the girls draw was again more to form, and all fourth round matches were straight-set wins. 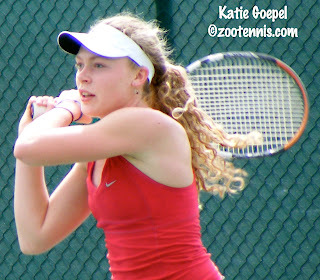 The only minor upset saw Katie Goepel, a No. 17 seed, defeat No. 11 seed Alexandra Leatu 6-3, 6-2. Goepel's quarterfinal opponent will be fifth seed Krista Hardebeck, who beat Catherine Harrison, a No. 17 seed, 6-3, 6-2. The second No. 17 seed to reach the quarterfinals is Julie Vrabel, who eliminated the last unseeded girl, Ellie Yates, by a 6-3, 6-2 score. Vrabel's opponent Thursday is No. 8 seed Robin Anderson, who downed No. 17 seed Kristen Dodge 6-2, 6-4. In the bottom half of the draw, the quarterfinals are exactly as anticipated according to the seeding. No. 7 seed Monica Turewicz will play No. 3 seed Danielle Collins, and No. 6 seed Whitney Kay will face no. 2 seed Lilly Kimbell. Turewicz defeated no. 17 seed Lynda Xepoleas 6-2, 6-4, while Collins stopped No. 17 seed Hanna Mar 6-3, 6-3. Kay got the better of No. 17 seed Annie Sullivan 6-4, 6-3 and Kimbell had a much easier time than she did in her three-set win on Tuesday, beating No. 10 seed Anna Mamalat 6-0, 6-3. The doubles semifinals are scheduled for Thursday, and although there are still quarterfinal matches underway due to the rain and back draw conflicts, the top seeded teams in both boys and girls draws have advanced. Defending champions Emina Bektas and Lilly Kimbell defeated Jacqueline Crawford and Whitney Kay, a No. 9 seed, 6-1, 6-3. The top seeded boys team of Chase Curry and Jeffrey Offerdahl advanced to the semifinals with a 6-4, 6-4 win tonight over unseeded Casey Kay and Grant Roberts. For complete draws, including the consolation results, see the TennisLink site. For the third day's video from Dave "Koz" Kozlowski at indietennis.com, click here. It's raining this morning in Mobile, so it seems like a good time to look ahead to my next tournament, the Blue Gray Tennis Classic a couple of hours north in Montgomery, Ala.
As I did last year, I will be covering the final of the 16-team men's tournament at Lagoon Park for the Tennis Recruiting Network before heading back to Michigan. Due to a schedule change, there won't be any SEC teams competing, but No. 16 Texas Tech and No. 17 Oklahoma will be among the favorites. The tournament has an excellent website, so to see the remaining teams and keep up-to-date, visit bluegraytennis.com. For three of the four top seeds at the Spring Nationals, the third round looked like it might be the last main draw singles action they would see this week. Girls No. 2 seed Lilly Kimbell lost the first set to Ronit Yurovsky, a No. 17 seed, and was down a break in the third set. Boys No. 3 seed Nathan Pasha was down 4-2 in the final set against unseeded Jeremy Efferding. Blake Bazarnik, the second-seeded boy, needed to win a third set tiebreaker to get by Danny Riggs, a No. 17 seed. All three managed to do what they needed, and advanced to Wednesday's round of 16. Bazarnik was up 4-2, 40-0 in the final set against Riggs, but when Bazarnik lost that game, Riggs sensed he still had a chance and played very well in the next five games. Bazarnik seemed reluctant to hit through the ball or play aggressively, while Riggs played excellent defense, kept the ball down the center when he could and rarely making errors. In the tiebreaker, Bazarnik was the steadier player, but he didn't force the issue, relying mostly on Riggs's errors. Bazarnik went up 6-3, but Riggs held his serve on the next two points thanks to two backhand errors by Bazarnik. Perhaps losing that 40-0 lead in the seventh game was on his mind, but on his third match point Bazarnik tried the surprise tactic of serving and volleying. A stunned Riggs did get the volley back in play, but gave Bazarnik an easy putaway at the net, resulting in a 7-5, 4-6, 7-6(5) victory. Kimbell, who is the virtual No. 1 seed with the withdrawal of No. 1 Ellen Tsay, saved three break points at 5-5 in the second set, then broke Yurovsky quickly to even the match. That momentum didn't last long however, as she was broken at 1-1 in the final set. Yurovsky was giving Kimbell fits with her pace and her ability to put away a short ball, but Yurovsky couldn't hold that early break, surrendering her next service game. Kimbell saved a break point in the five-deuce game that followed, then both girls held in the sixth and seventh games. Yurovsky saved a break point, then had a game point serving at 3-4, but a couple of loose points later she gave Kimbell another opportunity to break, and Kimbell seized it. Serving for the match, Kimbell, who will be attending Georgia this fall, hit a perfect drop shot at 30-30, but Yurovsky saved the ensuing match point. Kimbell got a second one, and pounded a forehand winner, a particularly satisfying ending no doubt, as Yurovsky had been picking on that side throughout the nearly three-hour 3-6, 7-5, 6-3 contest. Pasha and Efferding, who both train at the USTA's National Center in Boca Raton, were in a similarly heated battle just a few steps away. Pasha won the opening set, then saw the wheels come off, as he dropped the first five games of the second set. He managed to break Efferding serving for the set at 5-0, then held his own serve, but Efferding didn't give him any reason for hope in the next game, holding at love. Pasha held to start the third set, but was broken at 1-1. Efferding held his next two service games, but serving at 4-3 he double faulted at 30-40 to bring Pasha even. At that stage, Pasha began to play much more aggressively, closing the net when one of his big ground strokes gave him an opening, and finishing with perfectly executed volleys. Serving at 4-5 Efferding saved a match point with a first serve winner, and got his next two first serves in too, winning those points for 5-5. Getting a first serve winner of his own at 5-5 30-30, Pasha held for 6-5, although he was not playing with the same abandon he had shown in his pervious service game. With Efferding serving to stay in the match, he went up 30-15, but Pasha nestled a forehand with inches of both lines to force an error. After a long rally at 30-30, it was Efferding who blinked, finding the net with a forehand, and Pasha had his second match point. Efferding got his first serve in, but Pasha's return was good, and when an Efferding forehand sailed long, Pasha's comeback was complete. Top seed Gonzales Austin again posted a straight set victory, defeating Denis Nguyen, a No. 17 seed, 6-3, 6-1. Next up for Austin is unseeded Nick Papac, who continued his run with a 1-6, 6-1, 7-5 win over unseeded Hunter Callahan. Papac is one of five unseeded boys to reach the round of 16. Jose Martinez posted the day's biggest upset with a 6-1, 3-6, 6-3 victory over No. 8 seed Robert Verzaal. Spencer Newman downed No. 16 seed Garrett Brasseaux, Gregory Scott beat unseeded Justin Crenshaw and Andranik Khachatryan defeated unseeded Hunter Reese to advance to the fourth round. The girls matches have gone more to form, with only one unseeded player left in the final 16--Ellie Yates, who defeated No. 4 seed Emina Bektas on Monday. Today Yates advanced when unseeded Ashley Noyes retired with illness at 3-6 6-0, 3-0. Yates will play Julie Vrabel, a No. 17 seed, who upset No. 13 seed Elizabeth Begley 6-4, 6-3. Annie Sullivan, also a 17 seed, downed No. 14 seed Tessa Lyons 5-7, 6-4, 7-5 in a three-hour contest. The doubles quarterfinals are set, and the top seeds in both divisions are still alive. Defending champions and top seed Bektas and Kimbell won in a match tiebreaker this evening over Begley and Blair Shankle. Chase Curry and Jeffrey Offerdahl, the No. 1 seeds in the boys draw, beat Austin and Callahan 6-4, 6-4. This is the first USTA National Championshiop tournament in which a match tiebreaker will be used in lieu of a third set in the early rounds. (The first round was mistakenly played under the 2009 rules). The third sets in the semifinals and finals will be played out. For the day 2 coverage of the Spring Nationals at Inside Tennis with The Koz, see indietennis.com. The weather stayed the same, but the intensity increased in second round action Monday at the 18s Spring Nationals. On another sunny, cool and breezy day, girls No. 4 seed Emina Bektas and boys No. 5 seed Justin Shane were upset victims, the highest of the 11 seeds to lose. It's still too early in the tournament to station myself at one place and watch a particular match, but I did manage to see two dramatic endings. I missed Mississippi's Ellie Yates' 6-3, 4-6, 6-2 win over Bektas because I was watching the end of a three-hour marathon between No. 17 Katie Goepel and Jacqueline Crawford, which Goepel won 5-7, 7-5, 7-5. Goepel was up 5-3 in the first set, she told me afterward. "I think I lost 12 or 13 points in a row, so that's three games there," said the 17-year-old from New Jersey. "I think I was being a little bit tentative there and I went into the second set thinking, I don't care if I lose the set, I have to be aggressive. I'm going for it." Goepel's strategy worked, but late in the third set, she found her own advice difficult to take. Serving at 4-4 in the third set, Crawford, 15, lost the first three points, saved one break point with a backhand on the line, but lost the next when Goepel hit a forehand winner. With the match on her racquet, Goepel double faulted to open the game, did it again at 15-30, and although she brought the game back to deuce, she threw in two more double faults, the last one bringing Crawford back to even. Crawford didn't take advantage of Goepel's nerves however, dropping the next game on a double fault of her own at 15-40, so the alphabetically seeded Goepel had another chance to end it. She got first serves in on the first two points, hitting an overhead winner and a forehand pass to make it 30-0. On the next point, Goepel's first served missed, but she sliced a second serve ace past a lunging Crawford to earn three match points. Goepel didn't get a first serve in on the first of those, but Crawford went for the second serve return, hitting it well long to give Goepel a hard-earned victory. "I was very nervous to close it out," Goepel said of her first attempt at serving for the match. "I went into it at 6-5 thinking I can't do that again; I have to pretend I'm not up 6-5, that it's not the end of the match. I knew I had to change my attitude." While Goepel survived, five other seeded girls, including Bektas, did not. Julia Fellerhoff, a No. 17 seed, lost to Sherry Li, while Jenny Hois, also a 17 seed, lost to Samantha Adams. Mara Schmidt defeated No. 12 seed Hanna Yu and Noor Judeh downed No. 9 seed Britney Sanders. I saw the second set of Andranik Khachatryan's 6-3, 6-0 win over Shane, and as is evident from the score, Shane wasn't able to do much right against the Californian. As Shane began to miss--often not by much, but with balls finding the tape or landing an inch or two beyond the lines--he became more frustrated, and Khachatryan needed only to keep the ball in play long enough for another error from Shane. At the desperation stage late in the match, Shane even resorted to a serve and volley, but nothing worked. He was broken again, and Khachatryan was through to round of 32 a few points later. In contrast to that swift and decisive ending, the match between Nick Papac and Andrew Adams took nearly four hours to play and was decided in a third set tiebreaker. Papac, who had taken out No. 12 seed Jackson Withrow Monday, won the battle, 7-6(5), 1-6, 7-6(3), over a cramping Adams. Adams showed his first sign of distress late in the third set, and with Papac serving at 5-6 15-15, Adams crumpled to the court. Unlike the new ITF rules, the USTA regulations still allow treatment for cramping, and a trainer was called to the court. After a few minutes, Adams got up and continued play. He lost the next three points, and didn't move well, but during the tiebreaker, the effects of the cramping were less noticeable. Papac, a left-hander, never trailed in the tiebreaker, but Adams had two serves down 4-3. He wasn't able to win either point, and when his volley went long down 5-3, Papac had three match points. He only needed one, as Adams put a backhand into the net to end the three-hour and 45-minute contest. Aside from Shane, five other boys seeds fell including Evan Song, the No. 11 seed, who lost to Gregory Scott. Four alphabetical seeds went out in the second round: Mesa Mei, who was beaten by Jeremy Efferding; Zachary Katz, who lost to Jose Martinez; Quoc Daniel Nguyen, who lost to Justin Crenshaw; and Winston Lin who was beaten by Casey Kay. The first installment of the daily tournament video report produced by Dave Kozlowski and Bob Gray can be found by clicking this link at indietennis.com. The video is approximately eight minutes long. For the complete results of the day's action, see the TennisLink site. The seeded players who have been competing indoors for the past three or four months had to contend with gusty winds and their first sunburns of the season, but most adjusted well enough to advance to Monday's second round at the USTA 18s Spring National Championships. A chilly morning and one less hour of sleep also were hurdles to overcome for those participating in the 40 singles matches scheduled for 8:30 a.m., but they did have the advantage of less wind, which didn't pick up until mid-morning. Top seed Gonzales Austin of Miami was on the court early, and the left-hander won quite a few of his points with volleys at the net in his 6-1, 6-4 win over Matthew Dooley. Second seed Blake Bazarnik of Illinois was one of the last singles matches of the day, and he had to withstand an opening set blitz by Ethan Kallick of Pittsburgh to record his 1-6, 6-3, 6-2 victory. Bazarnik got up early in the second set, but was broken serving at 4-2. Kallick lost his serve in the next game however, and he was unable to rattle Bazarnik, who didn't press and didn't express any frustration with the conditions or his level of play. The only top four seed in either division to lose was boys No. 4 Jamin Ball, who was unable to continue due to breathing difficulties in his match with Mitchell Polnet. Polnet was leading 6-2, 1-0 when Ball retired, and Ball also dropped out of the doubles competition. No. 12 seed Jackson Withrow lost to Nick Papac, who will be attending his hometown school Fresno State, 7-5, 7-6(5). Three alphabetically seeded (17) lost in the first round, Justin Rossi, Dan Richardson and Daniil Mamalat. They were beaten by Hunter Callahan, Daniel Ho and Spencer Newman respectively. I had hoped to see the Mamalat-Newman match, but the 6-0, 6-1 score conveys quite clearly why I missed it. The girls top seed, who is, with Ellen Tsay's withdrawal due to injury, No. 2 Lilly Kimbell, served very well in her 6-1, 6-3 win over Kaitlin Ray. Kimbell also found some acute angles, which kept Ray, who covers the court side to side very well, from getting into a baseline rhythm. Third seed Danielle Collins dropped only one game in her win over Ashley Tiefel. Megan Kurey defeated No. 16 seed Jennifer Kellner 6-4, 6-2, and three alphabetical seeds also lost, all in straight sets: Julia Jones to Theresa Smith, Christina Harazin to Laura Wiley and Rachel Stuhlmann to Julia Jamieson. For complete results, including those of the first round doubles matches played this afternoon, see the TennisLink site. Dave "Koz" Kozlowski was busy doing interviews of many players today for his first daily show on the Spring Nationals for Inside Tennis with the Koz at indietennis.com. Among the players Koz spoke with were Kimbell, Papac. Catherine Harrison and Sarah Dalton. The link to Sunday's show is here. It was a blustery day in Mobile, but practice courts were full most of the day, and player registration and photos, as well as the player meeting, kept players, coaches and volunteers busy. Alexandra Anghelescu, the 8th seed, and Ellen Tsay, the top seed, withdrew prior to the start of play. Tsay, who did make the trip to Mobile, was suffering from a muscle pull in her side that affected her serving motion. The draws, which can be found at the TennisLink site, were distributed Saturday evening. I'll be keeping my eye on the Boris Bogomolov--Andrew Adams match at 10:30 am and the Spencer Newman-Daniil Mamalat contest scheduled for 12:30 pm. On the girls side, an intriguing match is No. 2 seed Lilly Kimbell versus Kaitlin Ray, who reached the quarterfinals of the Tulsa ITF last fall. There are 40 courts in action at once on the first day, so I'll be fortunate if I get to see more than a few games of any one of them. The first round of doubles will also be played on Sunday. At the Banana Bowl in Brazil, the 2009 Mobile champion Beatrice Capra defeated Monica Puig 6-1, 6-4 to reach the final. Capra, the No. 8 seed, will play No. 16 seed Ulrikke Eikeri of Norway. The boys final features Asuncion Bowl winner and No. 7 seed Renzo Olivo of Argentina against ninth seed Juan Sebastian Gomez of Colombia. See the ITF junior site for complete draws. At the BNP Paribas Open in Indian Wells, both Ryan Harrison and Sloane Stephens lost their second round matches. Harrison lost to No. 20 seed Ivan Ljubicic 6-2, 7-6(2), while Stephens dropped a 6-4, 7-5 decision to No. 12 seed and defending champion Vera Zvonareva. For more results from today, see the tournament website. It's been a long day of travel, but we've arrived in Mobile, and the weather forecast for Saturday's registration and Sunday's first round of the USTA 18 Spring Nationals is excellent, with temperatures in the 60s and little chance of rain. The draws will be posted Saturday, although match times are already available on the TennisLink site. In college tennis today, the ninth-ranked Georgia men defeated No. 6 Kentucky 4-3 in a match played indoors in Athens due to rain. Georgia trailed 3-0, with the Wildcats winning the doubles point and at No. 1 and No. 2 singles, but the Bulldogs came back with Jamie Hunt leading the way with a come-from-behind win at No. 3, and Bo Seal winning 7-5 in the third at No. 4. 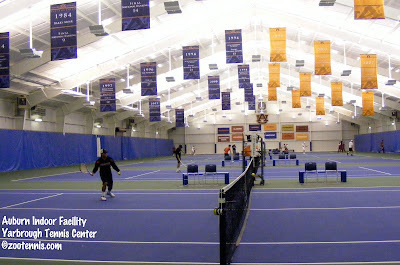 With only four indoor courts, Georgia's Drake Bernstein at No. 5 and Christian Vitulli at No. 6 took the courts knowing they both had to win, and they did, with Bernstein clinching at No. 5. For more on the match, see the Georgia athletics site. The women's Top 10 battle saw No. 7 Duke down No. 3 Notre Dame 5-2 in a match played in Puerto Rico. After being shut out by Florida, Duke bounced back against the Fighting Irish, taking five of the six singles matches. This result confirms that there are multiple contenders for the 2010 NCAA title, and the defending champions are certainly one of them. For more on the match, see the Duke athletics site. Because Ryan Harrison's win over Taylor Dent took place so late last night, I wasn't able to follow it, but there have been many stories written about it. Here is one by Richard Evans for Foxsports.com. The company that Harrison is keeping as far as 17-year-olds winning an Indian Wells match is impressive: Nadal, Sampras, Agassi and Chang. Harrison plays No. 20 seed Ivan Ljubicic of Croatia on Saturday. Sloane Stephens plays No. 9 seed Vera Zvonareva, the defending champion, on Stadium court. Another interesting matchup Saturday is John Isner against his college contemporary Kevin Anderson. For complete order of play, see the tournament website. The finals of the Grade 3 Costa Rica Bowl saw Mac Styslinger defeat fellow American Morgan Mays 6-3, 6-1 for the boys championship. Qualifier Gabrielle DeSimone of the U.S. won the girls title over Gaia Sanesi of Italy, the No. 2 seed, 6-4, 6-2. Michael Zhu of the U.S. won the doubles title with Canadian Andrew Ochotta. For complete results, see the ITF junior website. At the Grade 1 Banana Bowl, Maryland's Beatrice Capra and Florida's Monica Puig will meet for a place in the final. Capra, the eighth seed, defeated No. 16 seed Paula Ormaechea of Argentina 4-6, 6-3, 6-3, while Puig, the No. 2 seed, beat No. 6 seed Katarena Paliivets of Canada 6-1, 6-2.